L'emplacement est parfait pour les ski in / ski out et à distance de marche des restaurants et des boutiques du centre-ville de Breckenridge. Vue magnifique sur les montagnes de la chambre principale (face à l'ouest) et salon (face à l'est). Élégamment décorées avec de la moquette chaleureux et des accents de bois sombre. Foyer au gaz dans le salon. 4 BR / 3 BA confortablement jusqu'à 10 personnes sur 3 niveaux pour plus d'intimité. 4 TV (tous les écrans plats), chacune avec un lecteur DVD. Lecteur Blu-ray dans le salon. lecteur iPod dans le salon ainsi. Spa privatif sur la terrasse arrière. Brought the entire family for Spring Break. The ski in/ski out location was great for the the grand kids and grand parents as well! Nice accommodations and well equipped. 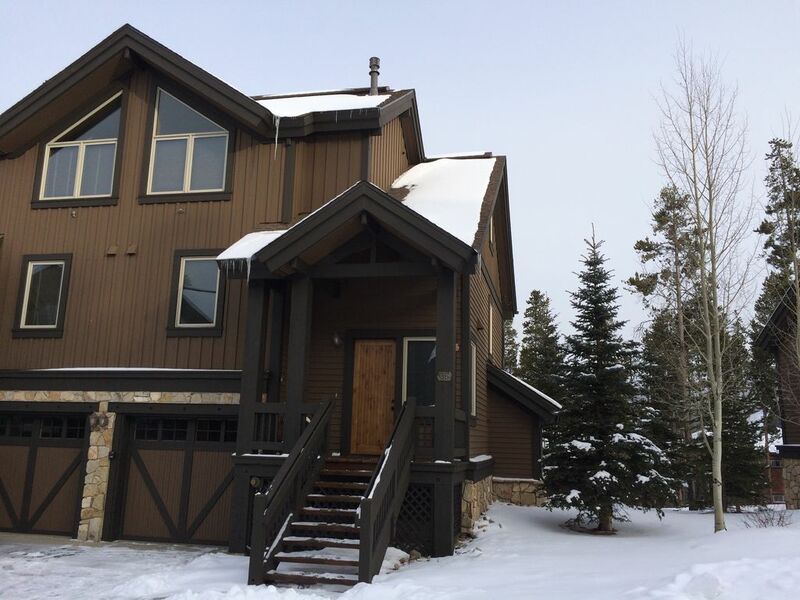 Located right in-between Peaks 8 & 9 This condo has it all...Great views, plenty of space, ski-in/ski-out, a private Hot Tub and just about everything you need for an amazing ski trip! Our family of 5 adults had such an amazing trip and were so comfortable for the week we were there. John was very responsive with all the many questions I had leading up to our trip and even after we arrived. The ski out was very quick and easy...just walk across the driveway, put on your ski and ski down to the Snowflake lift...however when it's time to come home you get a workout as ski-in was a bit more trouble...It is flat down the snowflake trail for most of the way home so your arms get a workout...You'll be ready for a hot tottie and the hot tub!!! But not complaining as we had a beginner skier with us this year so it too flat was better than too steep. We can't wait to go back! Great location, great home. Loved the floor radiant heating. Great location, that was close enough to Breck but still far enough away to not feel like we were in the busy mess of town. The place was clean and everything worked great. Parking is a bit tricky if you have more that full sized and 1 mid size vehicle. 1 small garage spot and 1 driveway spot. Our group had a fantastic time skiing, hiking and brewery hopping. The townhouse was a perfect hub for all our activities, especially for skiing - the access to Breckenridge mountain was easy, allowing us to stop at any point for a break. The hot tub was great for relaxing at the end of the day with a beer. Thank you John and Debbie. A great place to call home while on vacation!! Ski in / ski out is pretty simple. Take you skis out of the garage then walk 20 feet put them on and ski away to the lift just down the hill. Oh on the day we had 4 inches of new snow I put my skis on in the garage and off I went. Ski in works much the same...take your skis off and walk that 20 feet. Heated floors make for a cozy warm atmosphere and the Hot Tub fit for four is a great way to relax those sore joints. All in all...cant wait to go back again. Saddlewood complexe lotissement à ski in / ski out au Sentier de flocon de neige. Facile 1/2 mile à pied du centre-ville de Breck au Centre Riverwalk.